WayForward's sassy mascot Shantae will no longer be restricted to handheld devices for the first time in franchise history. Already sporting a loyal fanbase through the Nintendo 3DS and iOS platforms, the series finally has a chance to branch out to a whole new audience with the release of Shantae: Risky's Revenge on Steam on July 15. The news was announced in an update on WayForward's successful Kickstarter for Shantae: Half-Genie Hero. Remember asking for a PC port of Shantae: Risky's Revenge back in October? It was a popular topic during our live streams, and many more of you rallied hard to get the game through Steam Greenlight. It's going to happen. WayForward listened to the calls of its fans and made a huge step in spreading Shantae's reach with a full blown PC release. It's even adding content! Shantae: Risky's Revenge is already a huge non-linear game with an enormous 2D world to explore, but this Steam release will sport even more as a Director's Cut. The game will be available worldwide in English for $9.99! We'll be announcing exactly what "Director's Cut" is all about very shortly, but look forward to a new and improved Risky's Revenge from your friends at WayForward! Besides Risky's Revenge, the Shantae series is also home to the original Game Boy Color game, which I doubt will be following with a PC release. The Nintendo 3DS is still the best way to enjoy that game though, so no harm no foul. 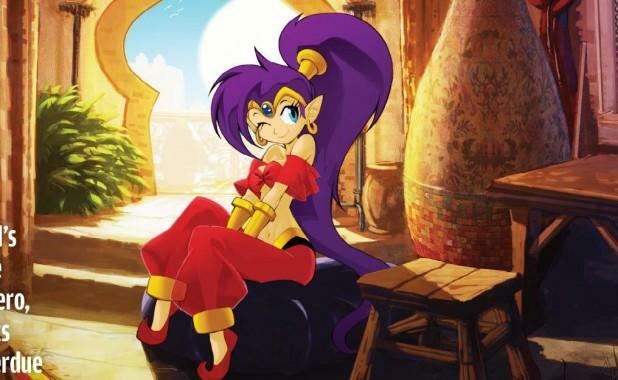 Shantae is also expected to pop up in two more games including the aforementioned Half-Genie Hero, a reboot of sorts which will be the first game to sport HD graphics on home consoles. The other is Shantae and the Pirate's Curse, the oft delayed sequel to Risky's Revenge which strips the genie of her powers, forcing her to rely on pirate weapons instead. It will be released for the Wii U and Nintendo 3DS, and possibly a PC release given recent events. Four games, one sassy purple haired heroine, and a whole new audience to attract. If you've ignored the Shantae series to this point for lack of interest in Nintendo handhelds, then you are now officially out of excuses. Check out Shantae: Risky's Revenge next week on Steam, where you can find it cheaper than its Nintendo eShop price by the way. Be sure to stay tuned for updates on the incoming sequels.